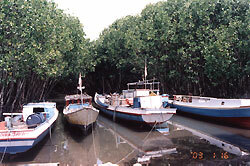 (2) The study aims at analyzing the sustainability of the silvo-fishery system, a combination between mangrove plantation and coastal aquaculture, in order to seek the better way(s) for sustaining the coastal conditions, in particular the harmonized integration between mangrove plantation and coastal aquaculture. (a) I have carried out fieldwork on mangrove plantation in coastal region of South Sulawesi, Indonesia, in order to clarify the relationship between locally-initiated mangrove rehabilitation and land-resource management and to understand the significance of the role of the community in the government-supported reforestation programs. The findings of the study are published at this web-site with the title" People and natural resource management in coastal region of South Sulawesi: A Lesson from mangrove rehabilitation". (b) I have also collected data on silvo-fishery systems in some selected areas in coastal areas in Indonesia: Cikiong, West Java, where the social forestry program, in particular silvo-fishery system, was first implemented in Indonesia; Cokke, Sinjai District of South Sulawesi, where the district government adopted the Cikiong model in collaboration with the former leader of ACI group (Aku Cinta Indonesia or I Love Indonesia); Bakko of Sinjai District; and Bontotanga of Maros District in South Sulawesi. The abstract of the study is published at this web-site with the title "A comparative study to seek for sustainable implementation of silvo-fishery systems in coastal areas in Indonesia". (c) Comparative studies on silvo-fishery systems also will be conducted in some selected places in Southeast Asia, such as: Thailand, Vietnam, and the Philippines. (3) People and Natural Resource Management in Coastal Region of South Sulawesi, Indonesia: A Lesson from Mangrove Rehabilitation. The study was carried out in coastal region of South Sulawesi, Indonesia, in order to clarify the relationship between locally-initiated mangrove rehabilitation and land-resource management and to understand the significance of the role of the community in the government-supported reforestation programs. The villagers in Cokke of Sinjai District, located on southeast coast of South Sulawesi, began to rehabilitate the coastal condition by their own efforts through mangrove plantation and they have planted about 30 ha with mangroves since 1980s along their village coastline. 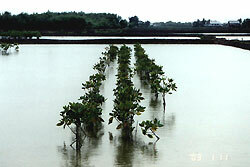 Mangrove plantation could provide them with opportunity to gain a new land and to convert it to fishpond, agricultural plantation and other purposes. Furthermore, after the success of mangrove plantation, the group of ACI (Aku Cinta Indonesia or I love Indonesia) consisting of the villagers who planted mangroves, has become possible to distribute seedlings of mangroves to many places in South Sulawesi, such as Bulukumba and Maros Districts through the forestation and land conservation programs supported by the government of South Sulawesi and the Ministry of Forestry. Participation of the villagers to conserving and rehabilitating coastal condition is the most important requisition. In particular, economic benefits of local people seem to be inevitable as shown in Bulukumba District where the plantation and land could be owned by the local people. The plantations in the Bulukumba District were more successful than other locations. The similar intention of local people on economic orientation can be also seen at a government's program in Maros District which involved participation of the villagers in conserving and rehabilitating the coastal condition through mangrove plantation within fishpond. At the initial stage of reforestation in Maros District, the program promoted the harmonic collaboration between the government and the villagers. The government tried to involve participation of the local people in conserving and rehabilitating the coastal conditions and the local people intended the multiple uses of fishponds for the economic benefits. However, recently, some of the local people began to take off the plantation because it cannot improve their fishpond production and disturb the harvest of fish and shrimp. Besides, the villagers anticipate that the government will claim their lands as government's property. Photo 1: Mangrove forests in Cokke of Sinjai District provide a safer place to the villagers including their boats, houses, fishponds, etc. Photo 2: Silvo-fishery system in Maros, which the mangrove seedlings were transplanted from Cokke of Sinjai District, South Sulawesi.